Book Update and Sneak Peek! Okay Friends! 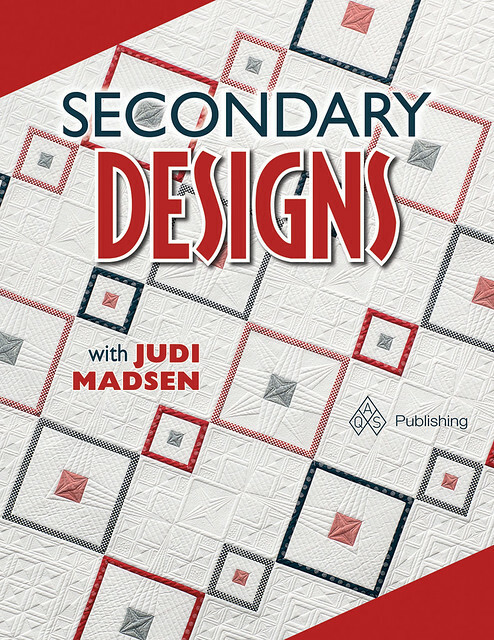 I need to update you on what is going on with my second book, Secondary Designs with Judi Madsen. First off, you will notice that the cover is a little bit different than the one that is on my site for pre-purchase, as well as the cover picture on Amazon. The cover change was a surprise to me, I saw the new cover when I went to Nashville a few weeks ago. 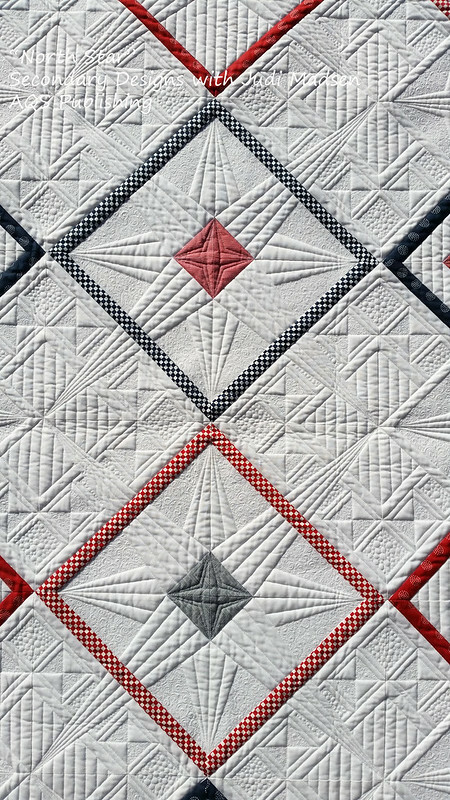 It still uses the same cover quilt (North Star), but a few changes in font and color make the cover page more grabbing or eye catching and exciting. I think it looks amazing and I hope you like it as well. As far as when the book is coming out, well - it seems like I am in a re-run with my first book. The original date was September, then October, then November and finally (fingers crossed) December. The back story to this is that AQS, my publisher, has decided to not be in the book publishing anymore, ugh. When I found out in July that they were rearranging things I was nervous that my book wasn't even going to be published. I have gone through all the crazy emotions that comes with news like this, but I am thrilled and happy beyond all reason that they have decided to go ahead with my book. I have done my final editing and the book looks amazing. It will have 122 pages of step by step projects and my design insights for 4 of 6 projects with plenty of quilting eye candy. Elaine Wilson has done a beautiful job editing and coming up with the design layout for my book and I cannot wait to share it with you. There will also be a jam packed CD with 2 more projects and the quilting outlines for the book as well as a chapter and in depth look into my studio. So, what does this mean for you who have pre-ordered my book? Well, just patience please. As soon as I have your book, I will sign it and ship it out. I promise I am just as anxious as you are to hold my book, so please know that it weighs heavily on my mind that you have been waiting for a while for a book you have already paid for. I really do appreciate you and your patience! It will ship out as soon as I receive it. Okay, so because we have to wait a little longer for the book release, I am going to introduce my projects in the book one at a time here on my blog until my book comes out. It is going to be a lot of fun and I hope you enjoy seeing each project. I am really proud of each one. So, introducing "North Star." Isn't she beautiful? Oh my word, I love her! 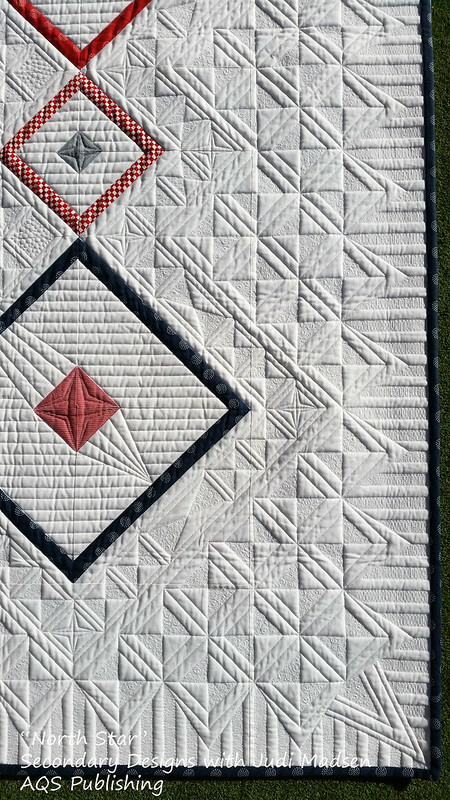 This quilt turned out exactly as I wanted it to, from start to finish. 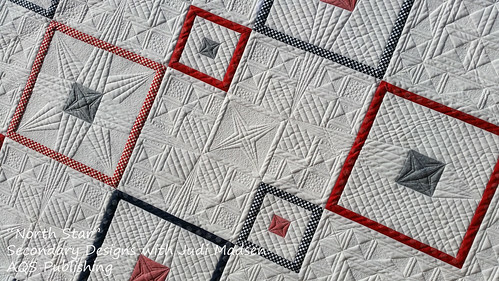 The white background with detail quilting is out of this world and I had a lot of fun making it, so I made sure that she was the cover quilt for my book. 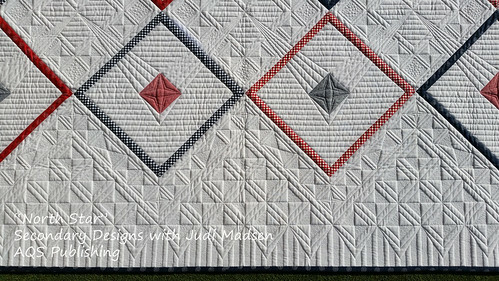 I used 2 layers of batting, So Fine thread for the quilting and a lot of Moda Bella Solids white 9900-97 for the fabric background. 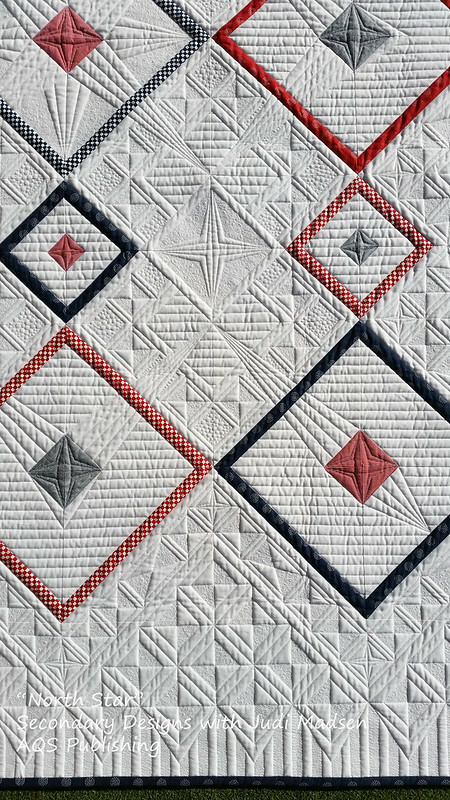 The red and blue fabric is from the Reunion line by Sweetwater from forever ago, but any fabric would look amazing in this quilt. 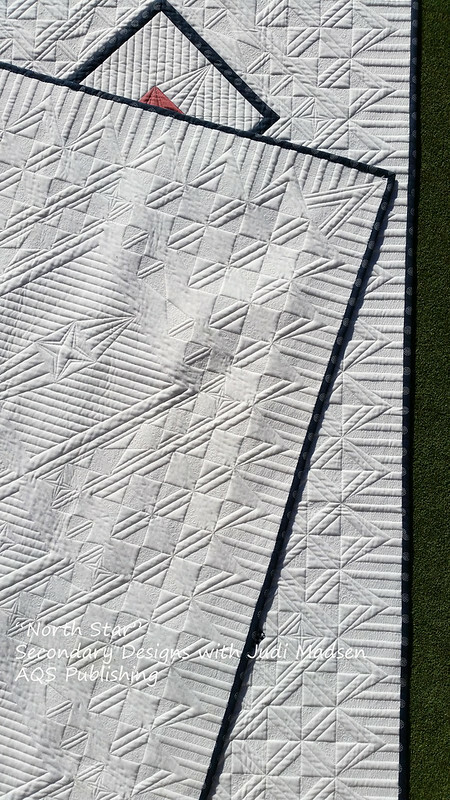 The quilting texture is just amazing. 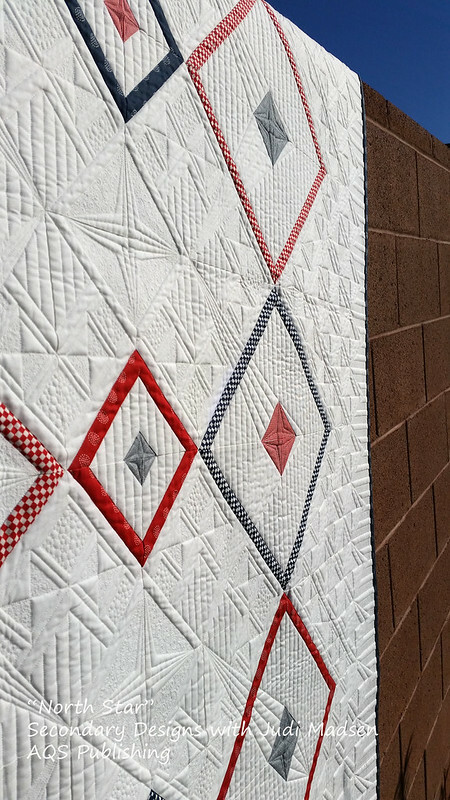 I smile every time I look at this quilt top. It is hanging in my studio now so I can enjoy it. 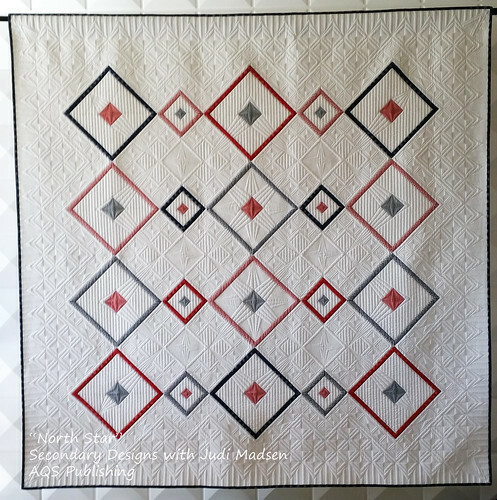 The quilting design in this quilt inspired the name of the quilt. 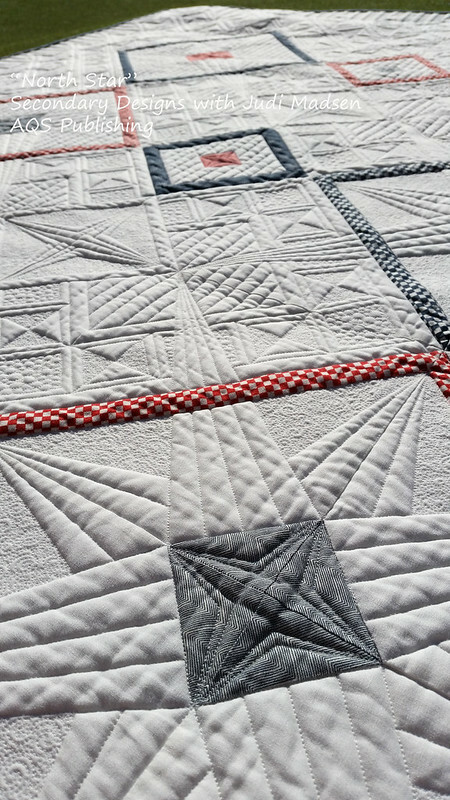 The center blocks have stars quilted into them and the center star in the main design made it easy to come up with the name, North Star. Isn't this border amazing? I think it is and it really was a lot of fun quilting up. 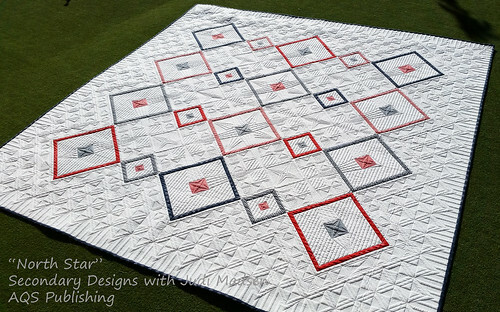 The step by steps instructions in my book will help you have the confidence to quilt up your own quilt. The corner, ahhh! I love it! I still can't believe this quilt is mine. 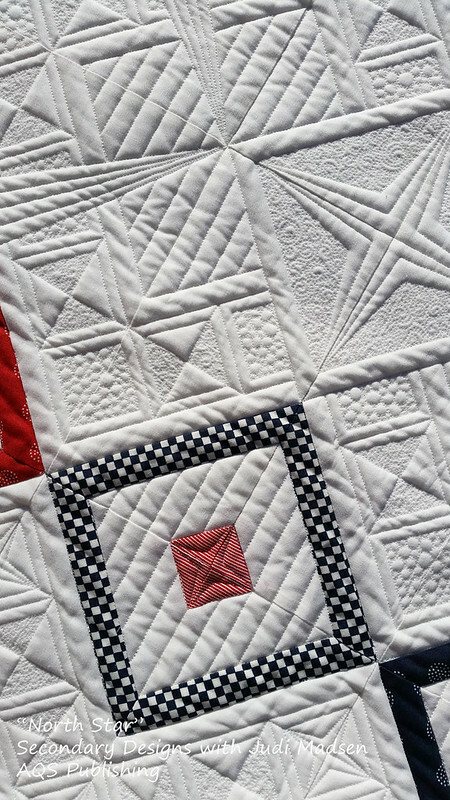 I work so hard on my customer quilts and have to send them away, but I get to keep this one. That is the best part of writing my book, having heirloom quilts that I get to enjoy and then pass down to my children to enjoy as well. 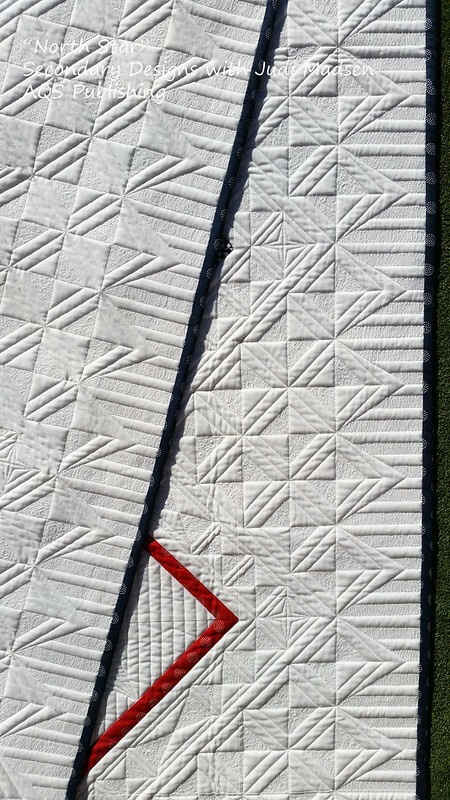 You can see that I tried to keep the balance of quilting in this project with simple lines in the blocks. Here you can see the "North Star" up close. I love it. Here is a shot with the back and the front. And another shot because I couldn't just chose the one picture. So, there you go. I really hope you enjoyed looking at North Star and I hope you look forward to making it when my book comes out. It will be out before we know it and the wait will definitely be worth it. Thanks for reading!